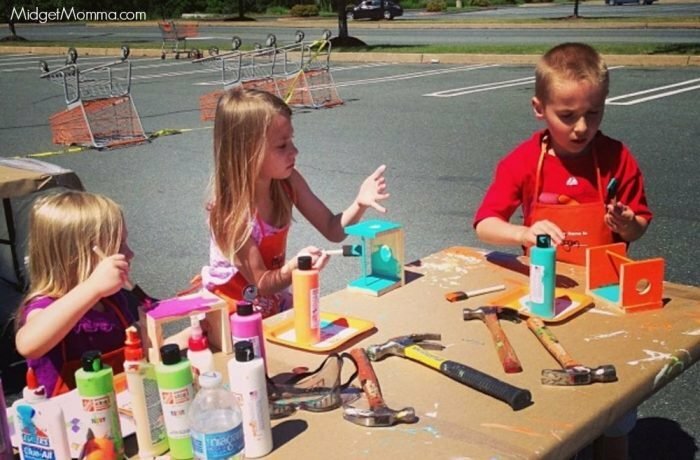 If you are looking for something fun to do, the FREE Home Depot Kids workshops are perfect! 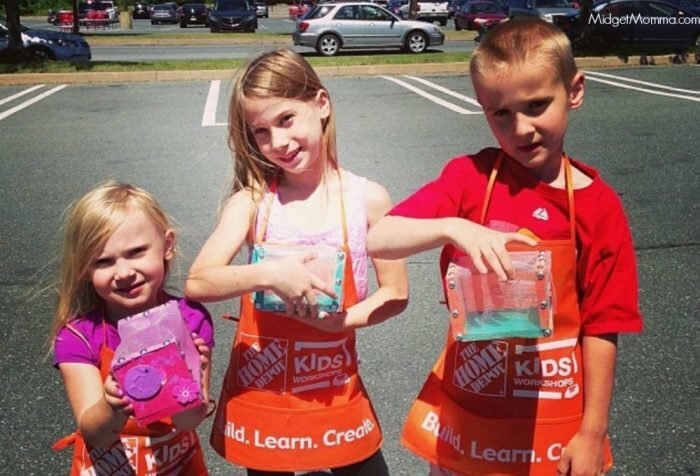 Home Depot has these FREE Home Depot Kids Workshops all year long! The Home Depot Kids Workshop is a hands on activity for the kids every Saturday of the month! These free kids workshops are held at your local Home Depot Store. Depending on the weather, they are inside or outside. They are so much fun for the kids! We made the bug house when I took my kids for our first free kids workshop and they loved it! It was the start to our love for the Home Depot Kids Workshops! The kids get to make whatever project it is for the month, which does change each month. After they make their project they get to bring it home! Along with the monthly kids workshop project the kids get some extra goodies too! They also get a free certificate of achievement, Home Depot Apron and commemorative pin! Next Home Depot workshop is May 4, 2019! Make Mom’s day with a handmade blooming art piece. In this hands-on workshop you and your child can discuss the art of patience as you build a blooming work of art to gift or put on display. Once it is built, your child can decorate it with paint. Just head over here and register! Scroll down the page and CLICK on the Register tab. The kids will also get a FREE apron, commemorative pin, and certificate! Check out even More Kids Fun! If you are looking for things to do with the kids after doing the FREE Home Depot Kids Workshops, check out these 9 Ways to Have Summer Fun on a Dime! If your kids love slime, then make sure you check out this post on how to make slime without borax and all of these other awesome slime recipes that we love! Harkins Summer Movies. See movies at Harkins theater during the summer for just $1! If you are looking for awesome deals all the time, family fun and more make sure you join our facebook group here. If you are looking for tasty recipes that are perfect for family meals head on over here and join our facebook page to get new recipes each day! Great place to go with kids!